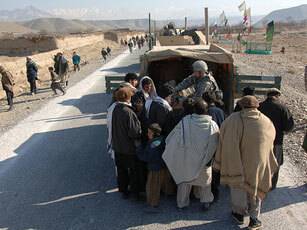 Villagers in Nijrab, Afghanistan, receive aid from the Bagram Provincial Reconstruction Team. Even as the U.S. prepares to send 17,000 additional troops to Afghanistan, President Obama has made it clear — military force alone isn’t the solution. To that end, he’s proposed negotiating with moderate Taliban leaders. As the U.S. forges ahead in the war in Afghanistan, a Worldfocus contributing blogger turns his attention to the Afghan people and their perception of the West’s role in the country, writing that trust is melting away as the years pass. He was referring to the generic questions Westerners ask Afghans: What is your life like? Where is the Taliban? What are your village’s needs? This particular elder has regular contact with American troops, and likes Americans enough to have tea with us. Nevertheless, he was deeply frustrated by the way, for all our questions, we never seem to learn from our experiences. Very few people in Kapisa province assume that coalition forces are there to do them harm. They acknowledge that ISAF behaves fundamentally differently than the Soviets did. Yet as the seventh year of the war begins, there is enormous frustration with the coalition for not learning from its mistakes, and also with the Afghan government for being unresponsive. Indeed, countless interviews indicate that people in Afghanistan have very little confidence in their local government or the police, instead trusting their shuras (community and district councils) and the Army to represent their interests. An incident I witnessed at the end of February is illustrative. I was having tea with the Afghan National Army unit guarding the gate of U.S. Forward Operating Base Morales-Frazier in Central Kapisa when we heard a commotion. Outside the HESCO barriers, two Toyota Corollas — the most common car in Afghanistan — had collided. The drivers were busy yelling at and slapping each other. Two ANA soldiers ran toward the wreck and tried to pull them apart. After the men eventually calmed down, and as one was handing the other money for repairs, a policeman showed up. An ANA soldier approached him, waving his hands, but the policeman walked past him and proceeded to take about half the money from the drivers before heading back to his roadside checkpoint. The ANA soldiers walked back into the hut where they had made me tea, shaking their heads. When I asked them about what had happened, they appeared clearly frustrated but were unwilling to discuss it. Corruption and ineffective governance of all sorts is an enormous problem in Afghanistan. But although the coalition has taken to blaming most of its problems on that corruption (and on Pakistan), the lack of headway in fighting the insurgency is due more to its own inability to learn and adapt quickly enough. Interviewing village and community elders in Central Afghanistan can reveal a tremendous amount about what Afghans believe are the country’s most urgent problems. Security is certainly among them. One of the few lessons from Iraq that is applicable to Afghanistan is the pressing need for more troop presence, off of forward operating bases and on the ground, for long periods of time. That remains a distant and unobtainable goal, though, making it difficult to protect people who are threatened with beheading for, among other things, attending high school or a local shura. But while security cannot be ignored, the West tends to exaggerate its importance. Indeed, when people complain about building new schools — “There are no jobs,” one said, “so what good is an education?” — and instead beg the U.S. for wells, roads, irrigation, and flood control, it’s easy to think that maybe we’re missing the point entirely. Either way, there is a palpable sense that the good will and trust coalition forces enjoyed in Afghanistan in 2001 and 2002 is melting away. By this point, some elders are witnessing their ninth rotation of well-meaning Americans asking them the same 25 questions about their lives. Photo courtesy of Flickr user Army.mil under a Creative Commons license. The rest of the daily matters (of Human Midrashic Interpretations) both by actions, thoughts and words have been, are now, and will remain: mere commentary on that First Chapter. This…so far as the wisdom of the flesh is concerned. What is ongoing from ancient times even to this day and night. “Υπάρχουν δεν δώδεκα ώρες στην ημέρα; Αν κάποιος περπατάει μέσα στην ημέρα, δεν σκόνταμα, γιατί βλέπει το φως αυτού του κόσμου.” Αλλά αν κάποιος περπατάει μέσα στη νύχτα, αυτός stumbles, επειδή το φως δεν είναι σε αυτόν . “- Ευαγγέλιο του Ιωάννη 11:9-10. “Are there not twelve hours in the day? If anyone walks in the day, he does not stumble, because he sees the light of this world. “But if one walks in the night, he stumbles, because the light is not in him.” –Gospel of John 11:9-10. American and the Afghanistan have more in common that the names of our counties starting with an “A”. True, we do have two different religions, but the more we get to know one another’s deepest aspirations – the more we see that we are the same. I wish all countries and cultures could find the common ground of one “Cosmic Ideology” or universal ideology. The one Cosmic Ideology will have to be preached: that one Supreme Father, the Cosmic Entity, is the goal of all living beings. We don’t need a religious name for it. This spiritual sentiment will keep humanity united for all time to come. It will form the entire world into a nation – one world nation. Then there will only be a united human society. We can move together, helping one another in the progressive movement toward our destiny and individual genius will not be nipped in the bud by injustice.